During the late Spring and early Summer, corn plants are in a critical stage of rapid growth and some big decisions need to be made about what’s going to help farmers reach the best possible yield potential. At this time, you may be asking yourself, is my current nitrogen plan the right one to support my crops throughout the growing season? When it comes to side-dress or late-season applications, you’ve got one shot to make the necessary adjustments to your nitrogen plan to avoid any costly shortfalls at harvest. During this season’s sidedress, farmers had many things to factor in, such as the warm, wet weather experienced in Winter and Spring affecting most of the corn belt. In fact, the Winter of 2015-2016 was the warmest on record in 120 years across the U.S. Corn Belt with unusually high soil temperatures and record-breaking rainfall. Weather events such as this caused a 25-30% loss of nitrogen availability in the top 2 feet of soil between December 2015 and January 2016 at our research farms in Illinois. Taking the right approach to nitrogen management during the side-dress window is a critical factor to the success of your crop. As you and your trusted advisors make decisions about nitrogen needs throughout the remainder of the season, there are a number of planning and monitoring tools that can provide insights to help you make decisions about your nitrogen program with confidence. Applying nitrogen after your corn is out of the ground is the best way to minimize nitrogen losses and protect yield, but it is important to understand your management options. A side-dress or late-season injection of either UAN solution or anhydrous is generally the best method, allowing for high application rates with little concern for tissue burn or volatilization. Alternately, broadcast applications can be effective but must be more carefully managed. An over-the-top application of urea can be a good option, as long as it is followed by rainfall that can incorporate it into the soil profile. Other dry nitrogen products – especially ammonium sulfate – can harm the plant if granules land in the whorl. Finally, broadcasting UAN, while often not ideal, can be done at early growth stages – typically for corn less than six-inches tall – as any leaf burn will often not have major impacts on yield. Later applications of UAN should be banded to minimize contact with the plant. 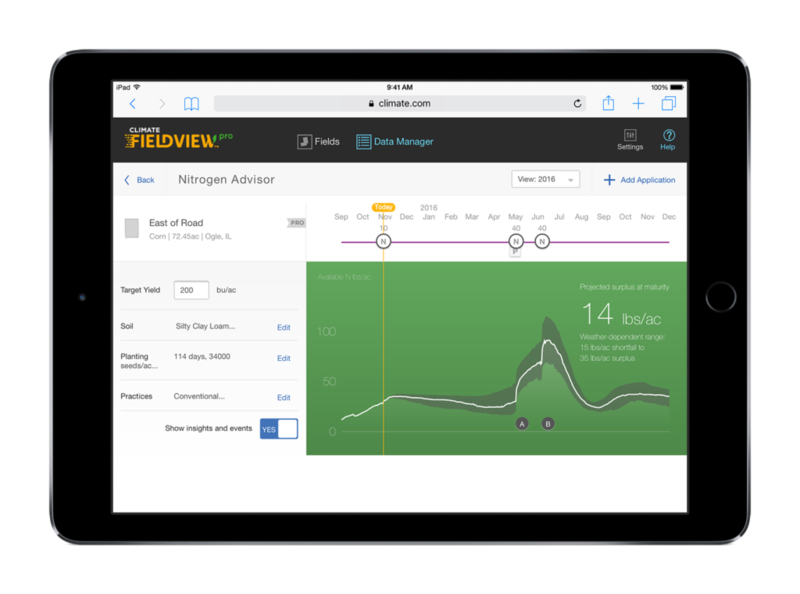 Nitrogen Advisor in Climate FieldView™ Pro helps manage your nitrogen and prevent crop stress by estimating the total amount of nitrogen uptake by the crop throughout the growing season as well as estimating volatilization, denitrification, leaching and runoff. With Nitrogen Advisor, you can monitor your specific nitrogen programs on all of your fields and update your program to run scenarios to determine the right rate and the right time of application based on the projected nitrogen available at black layer. In Climate’s 2015 field trials, we found that more than 80 percent of the time when Nitrogen Advisor projected end-of-season shortfall during the side-dress window, a side-dress application protected the crop from yield loss due to nitrogen deficiency. The insights generated through Nitrogen Advisor can help you identify shortfalls and focus your attention on fields that need it most. 360 Yield Center’sTM 360 Soilscan soil analysis acts as a great partner with your Nitrogen Advisor to validate soil conditions on a specific day. Combining these tools provides real-time and historical information to help you make informed decisions about nitrogen applications. Having multiple sources of insights and harnessing the power of technology with soil analysis can eliminate a lot of guesswork when it comes to side-dress or late-season applications. These insights will help you build the right nitrogen management plan to help your plants develop from planting to harvest. For more information, visit Climate.com. Todd is Climate’s Technical Agronomy Director. During a career that expanded over 10 years with Monsanto, he held critical roles in Seed & Trait Licensing, Product Management and Technology Development. Todd is an Agronomist by training with a Masters Degree from Oklahoma State University.